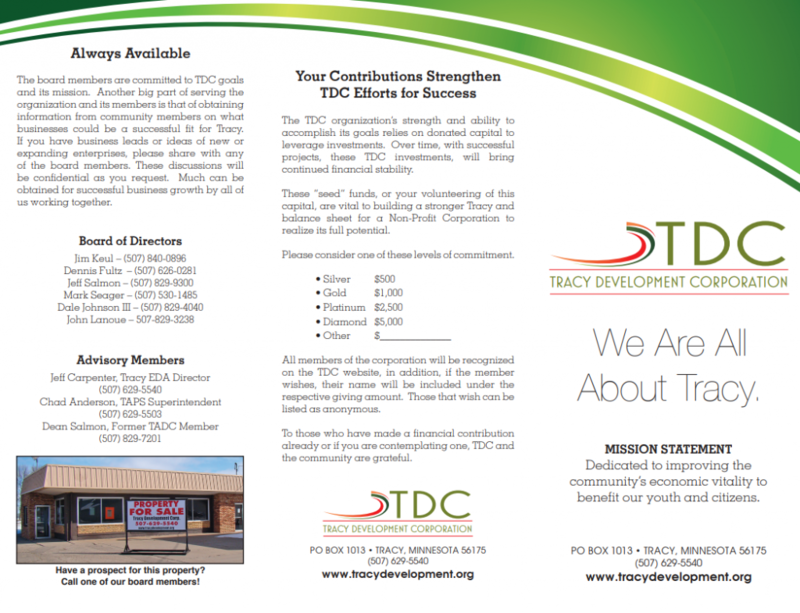 The Tracy Development Cooperation is a 501 (c) (4) non-profit corporation dedicated to the economic growth and development of the Tracy area. We are governed by a board of directors comprised of the highest levels of local leadership in business, government, and education. We meet regularly to discuss ways we can better serve the needs of the community, and to implement policies and drive actions which will lead to sustainable economic growth within the region. We believe in the public-private model of economic development, where each sector can leverage its resources, skills and strengths with those of the other to achieve common goals and produce better outcomes. Small town. Big future. Tracy, Minnesota. Need more info? Print off a copy of our brochure by clicking above!